Despite the cold winter we had this year and the cool, wet spring we have had so far, I’m still looking forward to a return to more seasonal temperatures by my warm season plant out date of May 17. This is the date that there is a 10% or less chance of frost (one year in ten there may be a frost after this date) in the Clarksville area of Maryland. To find spring frost/freeze dates for your area, click on this link. So, assuming that warm weather will return, I have started all of my transplantable warm weather vegetables on schedule (click on “Seed Starting and Planting Dates” in the top left corner of the page). By starting these vegetables indoors under fluorescent lights, I get a 4 to 8 week head start on the summer season and, thus, earlier yields from these crops. The latest vegetables started were my cucurbits. I sow seeds of my cucurbits about 4 weeks prior to my plant out date in 4 inch pots, filled with soilless mix, 3 or 4 seeds to a pot. Once they sprout, I usually thin the pots to the two strongest plants, keep them under the lights for two weeks, then move them into my cold frame for a week of hardening off. Cucurbits are easy to start and one of the few vegetables which can be started without fluorescent lights. Just start them in a warm area and after they sprout, sit them outside in a sheltered, sunny area. Just remember to bring them is at night or when temperatures dictate. 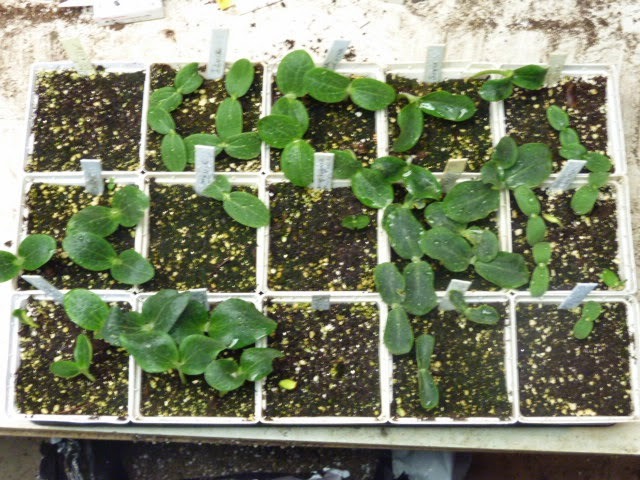 As you can see from the picture, most of them have sprouted, although a few of the lazy ones are waiting for warmer weather. If these don’t sprout in the next couple of days, I’ll reseed them and try again. It’s not to late to start a couple of pots of your favorite cucumber or summer squash inside and by doing so, you’ll get earlier production from your cucurbits.